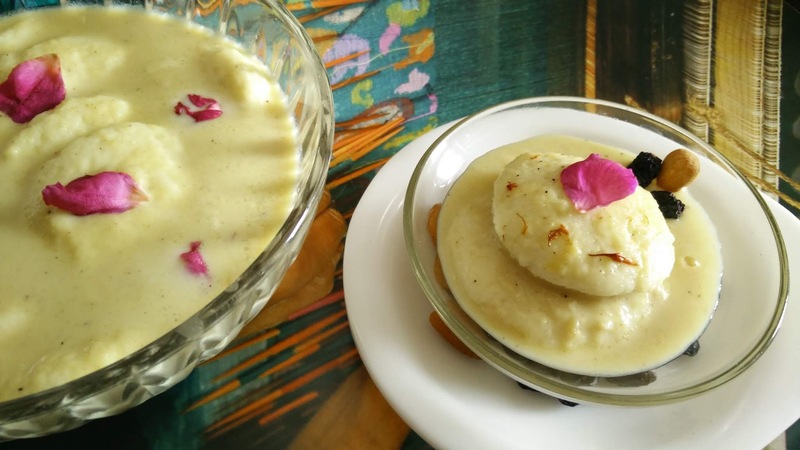 Rasmalai is one of the most favorite Indian dessert malai recipe. Normally, rasmalai is make using sugar syrup and is loaded with sugar. But we have tried steamed version of rasmalai which is healthier and more tasty. Rabri/ Rabdi - Keep the milk for simmering till the consistency reduces to half the quantity. Keep on stirring in between to avoid sticking of milk at edges and at the base. In a mixture jar, add almonds, cashew nuts, melon seeds, black pepper, sauf powder, little water. Make a paste of all these ingredients. Sieve this paste to get a thick paste and discard the left over. Add this paste in the boiling milk and keep simmering the rabri. Once thickend, add sugar at this stage and cook for 5 more min. Rasmali pcs - Crush cheese or make fresh cheese/ cheena (using milk). Add castor sugar. Mix well. Make small balls or pcs of this mixture. And steam these pcs in a steamer. Steam for 5 min. Add the rasmalai pcs in the simmering milk and cook for 2-3 min. Once cooked, cool for some time. Serve chilled. Garnish with black raisins, almonds, chopped pistachios, rose petals.